I am rereading a book that I read on my way to becoming Orthodox almost twenty years ago. The book is Abbess Thaisia: An Autobiography. It is published by St. Herman Brotherhood Press. When the Charismatic Protestant community that I was a part of first discovered Holy Orthodoxy, our only contact with the the Orthodox Church was through the books published by the St. Herman Brotherhood—who at that time published books mainly by Fr. Seraphim Rose and by or about pre-Revolutionary Russian monastics. We were so starved for information about the Holy Orthodox Church that we ordered and read every book they published. This was our introduction to the Holy Orthodox faith, and for us, it was a pretty good introduction. Of course we were profoundly ignorant. We thought, since these books (on or about Russian monastics) were the only exposure we had to the Orthodox faith, we even thought for a while that our whole community would have to become monastic in order to become Orthodox. Thank God, we finally encountered the Church Herself and, to paraphrase the book of Acts, we were taught the way more perfectly. Not only did we not have to become celibate to be Orthodox, but we could even be ordained to Holy Orders and stay married: There was great rejoicing in the land. 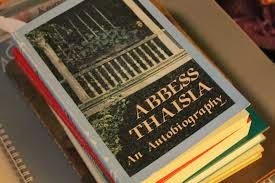 Abbess Thaisia’s autobiography was one of the first books we read on our way to the Holy Orthodox Church. It was a particularly helpful book for us because Abbess Thaisia experienced dreams and visions, something we Charismatics thought highly of. As a community we were used to God “speaking” to us and guiding us both individually and as a community through dreams and visions. Needless to say, we had a lot to learn about how such phenomena were handled in the Orthodox Church, ways that focus on humility, discernment and repentance rather than on the celebration of the experience. But that was to come. For the time being, it was enough of an encouragement for us that within the Holy Orthodox Church, people were seeing visions and having prophetic dreams. However, as I am rereading Abbess Thaisia’s autobiography almost twenty years later, I am struck by different things. I am about a third of the way through the book, and I have been struck this time by the amount of suffering, caused primarily by misunderstanding, that Mary endured on her way to becoming a nun and in her early years in the monastery. (Abbess Thaisia’s name in the world was Mary). Mary, and then later the nun Thaisia, suffered terribly from false accusations due not only to misunderstanding and envy but also due to the misplaced love of her mother. The enemy, however, is unable to endure peace among men, and soon enough he made his work felt. He induced those willing to listen to his insinuations to make venomous calumnies against me, and I, being an innocent victim, began to lose heart. Those around me were experiencing equally great confusion…. During the time that this storm was about me, I often lost heart. Not only was this calumny and affliction getting the best of me ([although] I had medicine to cure that: the knowledge that those who want to follow the path of the cross cannot avoid this), but a question kept confusing me: Why are those in authority so short-sighted as to be unable to discern truth from falsehood? Why are they so quickly inclined to trample down that which, not so long ago, occasioned their tenderness and concern? Another question also came to my mind: Where can one find the truth when it is absent even in its representatives? My sorrow was so great that it clouded my reason, and even my ability to clearly understand that our superiors are only ordinary human beings, and that one has no right to demand of them a clairvoyance possessed only by saints. Nor will I hide the fact [that] because of my great spiritual confusion I lost my zeal for prayer. When I stood at my icon-corner to pray, one of two things happened: either, having crossed myself, I fell down on the floor with great sobs (at which time the state of my soul was more stifled than prayerful), or a piercing question would keep drilling on my mind—“Where is the truth? Why does nobody defend the innocent? Why does nobody console their tears?” With that, trying not to give way to such despondent thoughts, I would hastily go to bed. But how could I possibly sleep?…. Finally the storm passed…. But my soul had been profoundly shocked, and it could not be easily calmed. In place of my former cheerful and happy manner, I became mistrustful, sorrowful, and suspicious. I could not help but realize (having personally experienced it) that all of this love and kindness could as quickly be changed to wicked and venomous mockery as one hour follows another. To put it briefly, my former frame of mind had left me. I even began to avoid my companions, scorning them, while inside I was languishing, asking myself over and over, “If even in a convent there is no sincere love—the cornerstone not only of monasticism, but of Christianity in general—then there is no salvation. And if there is no salvation, why are we on this earth? Once, with such thoughts in my head, I fell asleep…. And when Nun Thaisia falls asleep she has a dream through which she comes to understand that unjust suffering was the necessary cross she must experience to enter into the relationship with God that she longed for. Misunderstanding, false accusation, confusion, calumny: This is the way of the cross for many of us. We do not all experience the Cross the same way. But we all must experience the Cross, we must all “take up our cross and follow Christ.” For some, the Cross is sickness or injury. For others, it is mental imbalance of one sort or another: depression, adult ADHD, substance abuse and addiction, codependency issues, cognitive developmental issues. There are many ways people are challenged “just to be normal.” And all of these challenges are our cross—the very cross we must take up, we must accept and deal with. And not only accept and deal with, but follow Christ carrying. The addict must follow Christ even as he continues to struggle to stay clean. The one with depression must follow Christ, even as she continues to struggle to turn away from the darkness. We must all take up our cross and follow Christ. But in taking up our Cross and following Christ, we find peace—peace after the storm. We find a foretaste of the Resurrection to come—even as we are still tasting the bitterness of suffering. Some of us are even healed and delivered from a Cross. But then the Crosses only change. St. John Chrysostom said that when God delivers us from one Cross, it is only that we may learn to carry a heavier one. Suffering of one kind or another is the lot of every human being. There is no human life without suffering (How many children of wealthy parents abuse themselves, cut themselves and in other ways drug themselves because they cannot stand the pain of their life of privilege?) No, there is no human life without suffering. The only question is: Will you offer you suffering to Christ or not? Will you turn to Christ in your pain and trust in Him? Will you wait in the tomb with Christ for the Resurrection? Or, will you blame others, as our fore-parents did in the Garden of Eden? Will harbour resentment, nurturing with anger the growing root of bitterness? What will you do? That’s the question. The question is not whether or not we will suffer. We all suffer, sometimes more intensely, sometimes less intensely at various seasons of our life. We all have Crosses. We will all experience confusion and misunderstanding, pain and injustice. The only question is whether or not we will turn to Christ and find Grace and Love even in our pain, whether or not we will join Christ on the Cross—or like the thief who would only rail against Christ, will we suffer anyway, only to die alone, far from the Grace of God? This is the question. "Will you wait in the tomb with Christ for the Resurrection?" It is one thing to wait in a tomb; it is quite another to wait in that tomb with Christ and for the Resurrection. Thank you, Father. Thank you, great post. I am struggling with much of the same issue in your excerpt posted from Thaisia in regards to discouragement with those in church leadership and a lack of love by those in the church. My thoughts often drift to the same place as her's… If no sincere love is seen and experienced, then there must not be any salvation. Perhaps in the future you might speak to this point, as I know many of the younger generation feel similarly.